The Seven Lively Arts evolved from the concept of the seven Liberal Arts of ancient times. 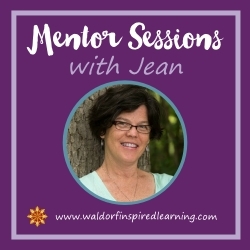 These were the key subjects one would master to become a scholar. But Rudolf Steiner felt that these liberal arts, once considered high arts, had become abstract sciences and that teaching needs to be alive rather than abstract. Instead, Steiner encouraged teachers to foster what is artistic in the child because the artistic element strengthens the will. This is the core of the Waldorf hands-on approach to learning. Here is a description of the Seven Lively Arts plus one! Storytelling is the plus one. It isn’t on Steiner’s list of lively arts because he considered it SO important! Rather than being on the list of the seven lively arts, storytelling is in its own category in the Waldorf method. We place it at the top of the star! Steiner talked about the importance of finding stories for telling and retelling that have a “free and narrative style.” This lays the foundation for speech and then writing. 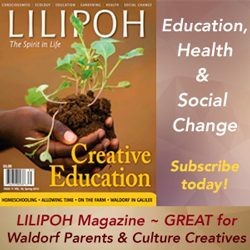 Since the Waldorf curriculum is delivered through stories and presentations of new material by the teacher, the importance of finding the right stories and resources is clear. Steiner also talked about the “imaginative process of creating” our own stories for our children. With storytelling, knowledge is passed on through narrative rather than direct instruction. From a Greek word meaning “beautiful rhythm,” Eurythmy is Steiner’s own movement art that he created with his wife. Eurythmy strives to make visible the soul and spirit of language and music through human movement. Steiner suggested that parents learn simple Eurythmy with their young children. Steiner never talked about the concept of “circle time;” that came from American nursery schools when the Waldorf movement came to the USA. 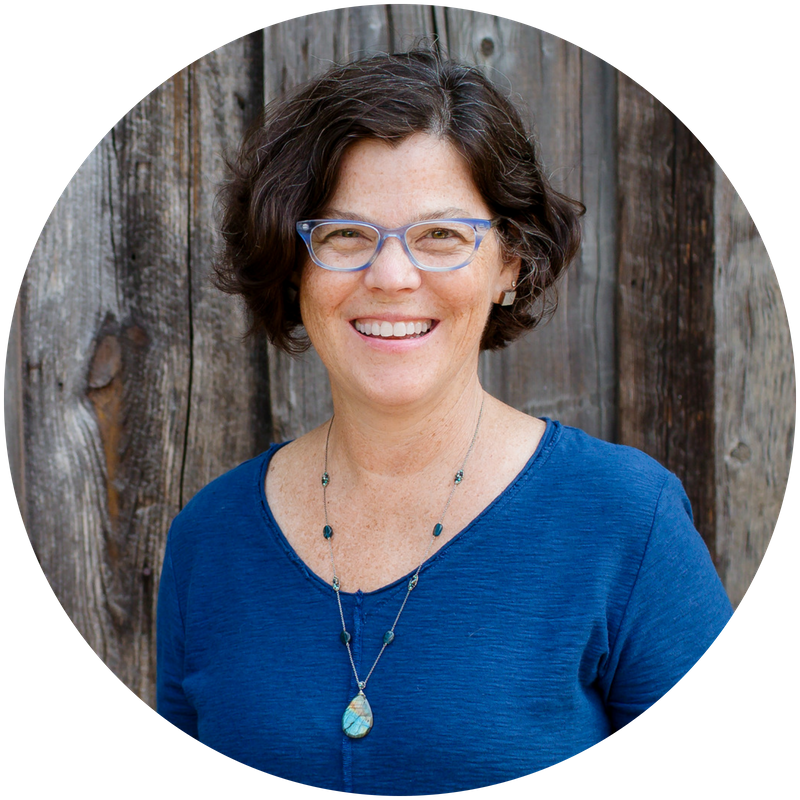 Steiner did speak on the importance of children engaging in “ring games” where groups of children are singing and moving to a poem or story in a large “ring” or circle. Steiner suggested these games, as well as gymnastics exercises, to help develop confidence, concentration, balance, control and coordination, a sense of rhythm, direction, and form in space. These ring games allow children to breathe out after doing concentrated head work. Large circle songs and dances are great for Festival celebrations as well. Thom Schaeffer, a Spatial Dynamics practitioner, commented that “the one thing homeschoolers lack most is movement skills.” So do make an effort to get movement into your lessons in as many ways as possible! Use rhythmic activity in warm-up each morning before the main lesson. This is harder at home because our children are often self-conscious and there is no power of the group. Consider convening a group or incorporate movement activities at other times throughout day. Warm-up Time can incorporate many of these lively arts: movement, music, and speech through verses. Begin the day with rhythmic activities – anything of a rhythmic nature has to do with feelings. 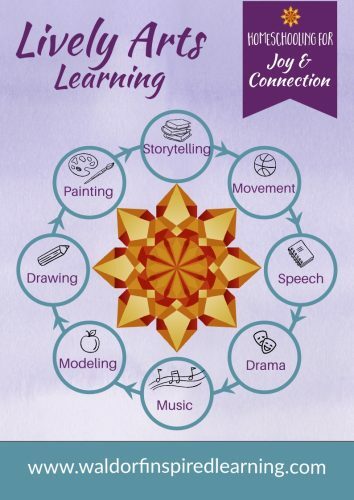 Rhythmic activity involves the whole body, warms up children to prepare for conceptual work, wakes up sleepy children and calms over-excited children, helps children remember the work of the day before, and deepens concepts the teacher has been working with. Research shows that children who are exposed to rhyme, alliteration (beginning sounds) and phonics (single vocal sounds) at an early age (such as ages 4 to 5) develop reading skills more quickly and effectively three years later. Drama and Role Play both help to develop recall and ease with speaking in front of a group. Drama can aid children in “acting out” temperaments, and helps a group work together socially. One can bring music to young children in two ways: through singing, or leading simple melodies on simple instruments. Pentatonic songs harmonize what children feel inwardly. The pentatonic scale leaves out the 3rd and 7th notes in the octave – the sharps and flats. Until age nine, the pentatonic scale fits with child’s inner being. Steiner: “Every child is a musical instrument and inwardly feels a kind of well-being in sound.” Steiner believed that the very forms of our bodies are made out of music. Sing the melody in the early grades. Children are naturally musical and imitate. Lead children into an experience of beauty and purity of tone through singing in unison. After age nine, rounds are appropriate and create harmony. Between the change of teeth and puberty, when the astral body is slowly being liberated, music is particularly important as an aid in this emancipation. In the upper grades, children can sing three and four-part songs. Steiner: “If you can, you should choose a wind instrument…it is a wonderful thing in the child’s life when this whole configuration of the air…can be extended and guided.” Choices include recorder, choroi flute, or penny whistle. Steiner explained that the pictorial and sculptural arts (visual arts) deepen our experience of ourselves as individuals, and that the musical and poetic arts bring people together and have a harmonizing effect. Painting is a way of exploring the beauty of colors on paper and gives us the experience of the quality and moods of different colors. We experience the harmony of colors inwardly. Accompany painting with a simple story. Mondays are good days to paint (water day – also good for laundry). Tell a color tale or integrate painting into the main lesson. 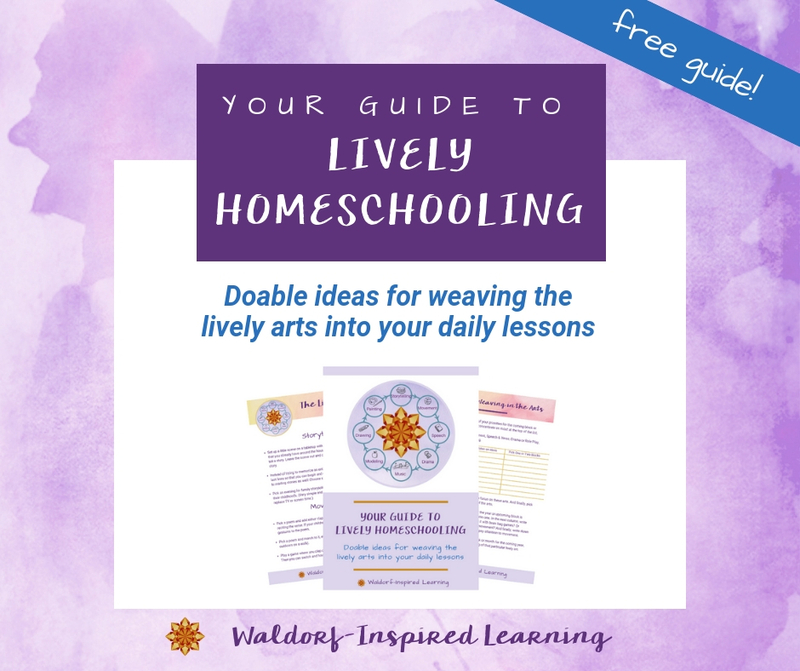 Steiner suggests that if children can be taught how to draw so that they let forms arise out of color and let lines arise out of the meeting of colors, they will be enlivened and will develop a truer relationship to the external world. Drawing is a skill we can all learn. Drawing has no right and wrong (unlike arithmetic); pictures will look more similar in grade one and become more individual. Drawing is an expression of feelings and images in your heart and head. To get away from outline drawing, draw lightly at first and then that can easily be changed. Colored pencils after age nine (because pencils force children to draw outlines). Modeling with various materials enhances a child’s experience of the curriculum and has a vitalizing effect on the human being. Working with the hands in this way trains observation and awareness. Modeling can be incorporated during or after a story, and often goes well with nature stories. The scene can then be set out on the nature table. Beeswax gives qualities of warmth, color and fragrance to suit the light and airy nature of the child. The progression of modeling materials begins first with beeswax in the early grades, then moves on to clay, then wood, and stone in high school. When Steiner describes the first day of school in Practical Advice to Teachers, he describes a conversation with the children about the importance of their hands – using their hands to work and create things. In the fourth grade block on the human being and animal, there is an important distinction about how our hands allow us to help bring goodness and beauty into the world. There are so many ideas for handwork, just remember to push through to finish! Handwork ideas: knitting, crocheting, weaving, hand sewing, embroidery, paper crafts, felting, woodworking, carving and so much more. Handwork projects can also be tied to the seasons and incorporated into Festival celebrations. Good luck and have fun bringing the Lively Arts into your lessons! 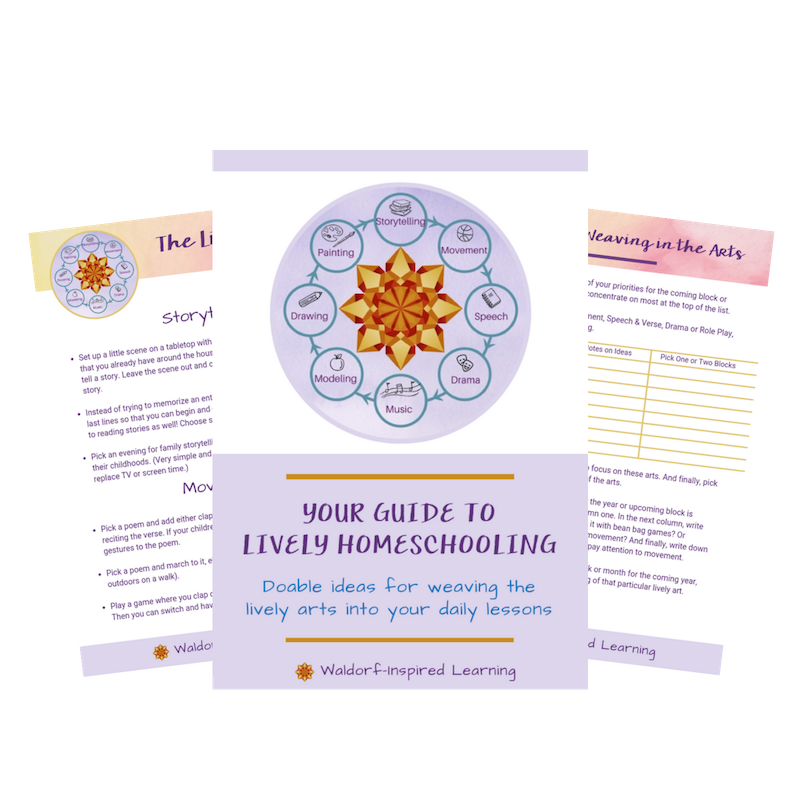 This will help to enliven your teaching and your time with your children. 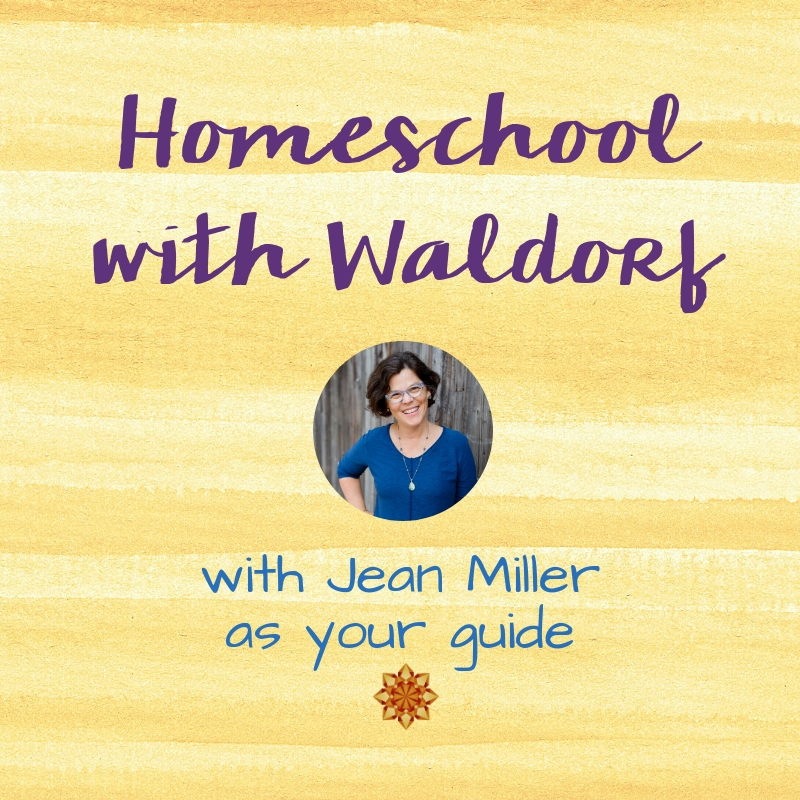 At the end of his life, Steiner talked about taking Waldorf education in a “drastically different direction” and was referring to grounding all teaching more fully in the arts! There are so many ways to do this that serve to inspire both our children and ourselves. Goethe believed that through art, human beings could reveal the secrets of nature that are concealed from our sense perception and consciousness. The concept of the Seven Liberal Arts comes from ancient times and grew out of the Four Branches of Knowledge in ancient Egypt: astrology, geometry, arithmetic and music. These Branches of Knowledge became the Seven Liberal Arts in ancient Greece, a time when spiritual and intellectual pursuits were intertwined. At that time, the Seven Liberal Arts included: grammar, rhetoric, dialectics, geometry, astrology, arithmetic and music. 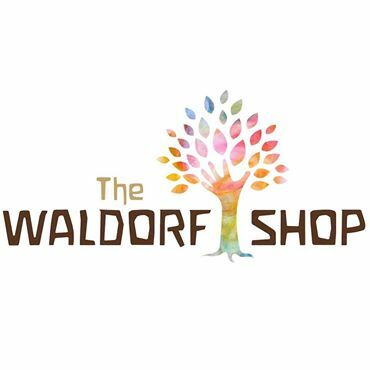 In the early part of the twentieth century, around the time Rudolf Steiner opened the first Waldorf School in Germany, the history of western art was characterized as incorporating the Seven Lively Arts: literature, dance, drama, architecture, sculpture, music and painting. There is a massive mural depicting these Seven Lively Arts at the Center for Performing Arts in Toronto! In his time, nearly one-hundred years ago, Steiner was concerned that teaching had become too abstract and strictly intellectual. 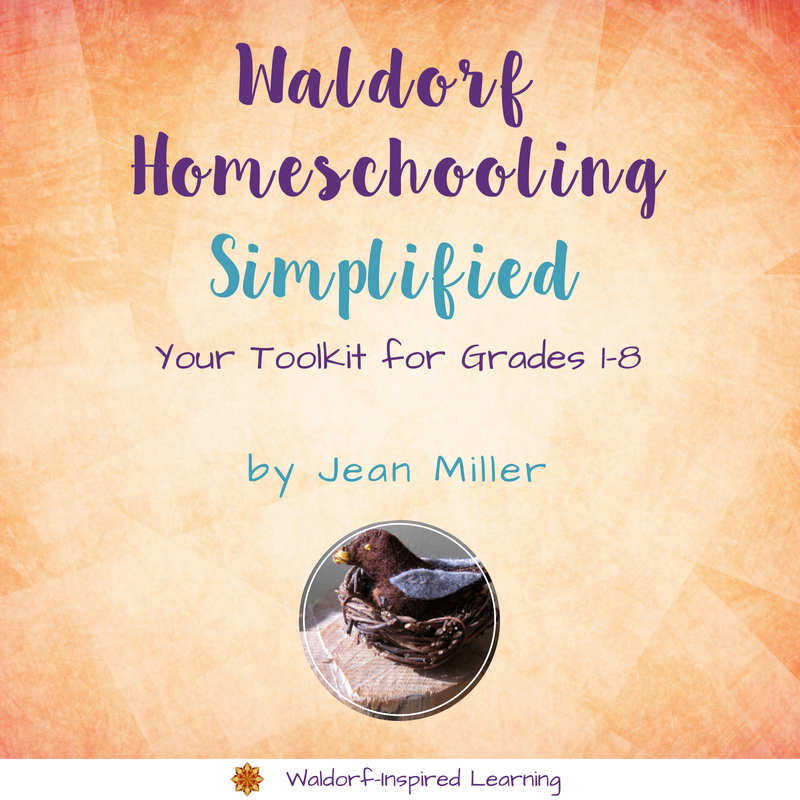 And so, he created Waldorf education to bring the elements of feeling and willing (through the arts and hands-on activity) into all lessons to accompany thinking. The Seven Lively Arts give us a great scaffolding for bringing the arts into all of our teaching and learning.